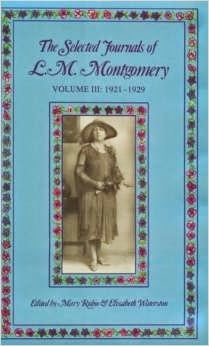 This year for Christmas my husband gifted me with the fifth volume in the Selected Journals of Lucy Maud. (Now I finally have the complete set!) So I figured I'd better play some catch up this month and read another of her journals and so found myself picking up The Selected Journals Vol. 3 . I like spacing out my reading of her journals because her real life wasn't quite like her books. Her books can pretty much be collectively described as jolly good fun but her journals reflect the turmoil in her life. I read Vol. I back in 2009 and Vol. II in 2011 (both linked to past thoughts). Now, please hear me. I don't begrudge a single person their personal "turmoil." If you are human, you have your own to deal with. That is life. That is human nature in a broken world. We will each of us struggle with our own issues and circumstances. Nothing about this fact should be unexpected or come as a surprise. However, I believe we were created to overcome such struggles and so I have a hard time reading through Montgomery's emotions as relate to her issues. I believe Montgomery wasn't very successful at dealing with her anxieties, making minimal attempts to do so and in manners which caused her more harm than good. As a result of that, I find it can make reading her journals a rather laborious process. Imagine meeting up with a friend for years on end and only ever hearing them complain. It would get old. Perhaps ironically, Montgomery kept these journals so that she would not become a tiresome bore to others. She rather prided herself on having perfected the art of looking happy and serene in public. More than once she notes that while her friends and acquaintances seemed only to write her letters filled with worries, she never stooped to writing worrisome epistles in return. Somehow, in her mind, not doing so made her a better person than the rest. She touts that she trained her face muscles to smile even when frustrated so that she would look happy on the outside and so that her dirty laundry wouldn't be aired to the world. Yet at the same time, she laughs at people behind their backs when they make remarks (that she makes a point to record in her journal) that she, "looks so happy!" "If only they knew...." is a constant refrain, delivered with a private mocking laugh. I find that sad. In many ways, I find Montgomery to be a contradiction. She moans that people don't understand her or her life; she mocks them and calls them "boring" and "stupid" with some regularity. At the same time, she refuses to tell anyone what things she is struggling with. She doesn't record that she makes any great attempt at making a friend out of anyone. (First impressions of people seem to be one of her downfalls.) To my way of thinking, Montgomery is one of the saddest, loneliest people in want of a friend that you could ever know. You want to try and be her friend and - at the same time - you want to smack her upside the head for withholding herself. This attitude of hers which wishes to seclude herself from the world begins to come into play in Vol II of her journals and it continues throughout Vol. 3 . "I am having a no good, very bad, perfectly horrible, rotten and altogether miserable day." There is very little that is cheery in her life during the years 1921 - 1926. Her husband Ewan continued to suffer from his mental anguishes, worried that he had committed the unpardonable sin and was dammed forever. Maud relates in her journal that Ewan sat under a "fire and brimstone preacher" when he was around 16 years old and that the effects of that sermon produced mental anguish and anxiety in him which, added to his already unstable state, produced long seasons of depression. He would become "wild eyed" and restless, anxious and unconnected to anyone or anything. He would walk the house in a fit and she was constantly under the strain and pressure of his "episodes", always fighting desperately to hide his abnormality from others. Ewan refused to believe that he had any issues and thus refused any sort of treatment, leaving the burden of the disease (for surely it was that) to Maud. It was a lonely battle for her to fight and I do not envy her it. I do think it is interesting that she pointed out that it was his exposure to some bad preaching that caused his acute anxiety. Of course, we do not have the text of the sermon which he heard which caused him to fixate on this unpardonable sin but it is useful to point out again how disastrous bad theology and poor understanding of scriptures can be. Correct theology is vitally important for your soul's health and also your mental health. I do think we should be vigilant to test the words of others against scriptures and be discerning concerning truth. I know it's tempting to not be bothered with learning theology but it is oh so very important. Good preaching wouldn't leave you in such a lurch for a lifetime. If the teaching you are exposing yourself to leaves you lifeless and defeated, then something is desperately wrong. The law of scripture still exists, yes, but so does grace and from what she describes of Ewan's faith walk, he did not know grace. This is incredibly imbalanced and a horrifying condition for someone without a mental disorder. Note: Montgomery didn't say that without having been exposed to this theology, Ewan would not have suffered so. Rather, she blamed this particular sermon on only his acute suffering. It was the thing he chose to focus on. She did not deny he would still have had his issues. I'm with Maud in assuming that Ewan had some type of disorder (although to this point in her journals, not diagnosed). This would be hard to live under. Whatever it is that he had seemed to go back a few generations but during this time period would have been a shameful thing, hidden away instead of brought to light so that a person could be better helped. We've learned a lot about mental disorders since then. Thank goodness. It's regrettable that Montgomery had to "go it alone" as it certainly created unimaginable stress which caused her write down on more than one occasion that her life was not a happy one. Least I make reading her journals seem like a complete and absolute dreadful thing, let me be quick to say that it isn't. Sure, it is hard reading because loneliness pervades her entries. We all know, in some form or fashion, what loneliness feels like. (If you don't know this, I almost wonder what is wrong with you.) It is unpleasant. On the flipside, when you are lonely you notice more things about the world and tend to find delight in smaller things that you might not have otherwise have done. (Enter the argument that occasional loneliness is good for the soul.) Loneliness serves its own purpose and sometimes that is to note beauty where others ignore it. So yes, in summary, her journals can be disheartening and depressing. Yet if you read them, you will also see the delighted, descriptive writer floating among the pages. Her descriptions of life circumstances are sometimes a total hoot. For the record, I think it is a good idea to train one's self to smile and be friendly with others even when you don't necessarily feel like it. (It serves you well to do this in the long run.) But I also wish that she had learned to be honest and let other people deal with her imperfections and help her to help her husband. In the end, Vol. 3 made for sad/happy reading. (More sad than happy.) But I learned more about Montgomery and that was the main point. I honestly don't know that I would have liked to know her in the flesh. I think it would have been hard (or impossible) to be able to do so. But I wouldn't feel quite right about saying I love her works unless I know the person who wrote them too, in all hardship and honesty. Therefore I'm glad to read her journals but I don't know that anyone other than a die hard fan would want to. Since I am that, I shall read on! Wow. What a post. What a journal. I've read through a good bit (and own) one volume of the journals, but at this point in my life I'm not sure I care to read any of the rest. Does this revoke my fan status? I had some of the same thoughts you did as you wrote. I agree about good theology and wonder why her husband didn't get into the Word of God himself and find the answers there (wasn't he a preacher?) Or maybe he tried but if he kept thinking the unpardonable sin meant something it didn't mean, I guess he'd be stuck. It's so sad he missed the grace oozing from the Bible. I wonder what was behind her need to keep up a false front. Pride, maybe? Or probably self-protection. I agree that sometimes we do need to paste on a smile even if we don't feel like it, that not everyone needs to be subject to our darker moods, but, as you said, she goes so far that direction. I don't think I am fan enough to delve into these (so far), but I am glad to learn more of them from you. I agree with everything you said. I am working on a novel which references the journals, so purchased the complete set. They are informative but tough slogging because of the constant moaning and complaining. I believe she was a victim of the restrictions of her society as well as her own pride. Had she had the courage to be her own person, she would have made different choices and been much happier.